Mommy's Nest: ...You might be a redneck. Well, it was coupon day at Costco and T-Bone had his first night of league golf - A WEEK TOO EARLY FOR ME - and so I had to pick up Boo Boo La La from daycare. Which means I have to leave work early - a curse and a blessing. 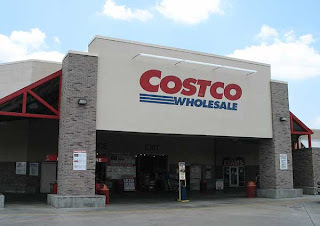 I love going to Costco on the first day of the coupon because then I am sure they have everything...and Boo Boo loves their cheese pizza, churros and berry smoothies...so we all win. Read: Mommy does not need to cook, YEAH! or as Boo Boo does it with a fist pump and a YESSSSSS! quietly, but forcefully. Mama, what does that sign say. No guns allowed in Costco. NO GUNS in Costco? You can't SHOOT in Costco? She seemed to take that now as a fact. Fast Forward to Thursday as we are walking into Costco. Mama, no guns allowed in Costco. You can't shoot PEOPLE in Costco. Yup, you can shoot SQUIRRELS outside of Costco though. Just not IN Costco. Okay.... (I notice some lady giving ME Maude Face...sigh) Here Boo Boo, give the man Mama's card. The State Highway leading to my place has a few 'Tractor Crossing' signs, complete with illustrations. And yes...It's normal to see an old guy ridin his tractor to the liquor store. PS. I ♥ 4 year olds for their awesomeness. Fabulous! Wonder how she worked squirrels into the conversation. My favorite sign outside stores is "No pet, excepts seeing eye dogs". Now I ask, who's gonna see that sign?